Disclosure: I received this product as part of an advertorial complimentary from BirthdayExpress.com for the purposes of review. All opinions are 100% my own. SweetPea's birthday is in December. Just a few weeks shy of Christmas. So I like to shop around all year long so I can get the best deal plus make sure I can afford everything for her special day. Being born in December, I feel she gets over looked by others, so I want to make sure her dad and I never do that. 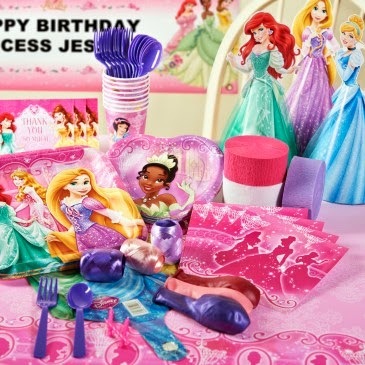 So when I received the opportunity to review the Disney Very Important Princess Dream Party - Deluxe Party Pack for 8 to Review from BirhdayExpress.com, I was very excited. BirthdayExpress makes party planning SO much easier, in my opinion. PLUS they are always running different sales and specials to take advantage of. I have shared my daughter's love of all things Disney on here more than a few times, so the plan is a Disney Princess Birthday Theme. And there is SO MUCH you can do with this theme! Follow Diana Chastain's board Birthday Party Ideas on Pinterest. I scored the dolls below for $2.50 from Target because they were misplaced in the 50% off Easter stuff. They made sure to remove all the other ones after I left, I assure you. I am going to save them and use them as extra decoration somehow for her party. You can find them on BirthdayExpress's website for $36. They also have other party packs to choose from depending on the amount of people you are inviting or how big you want the party to be. They have some other GREAT Party Packs for Girls to choose from, including Minnie Mouse and Frozen! I am already excited for her birthday, I can't believe I have to wait until December! Do you plan ahead for your kiddos birthdays? What do you think of the Birthday Party Packs from BirthdayExpress? Do you think they make birthday planning easier? Ooh I love that banner, what a perfect party banner. I found those Disney Princesses misplaced as well, but they would not adjust the price. I did find some in an Easter egg bubble package, which I got at a great price at 50 - 70 percent off. We've put them away for a birthday as well.